SUNDAY-FUN- DAY! 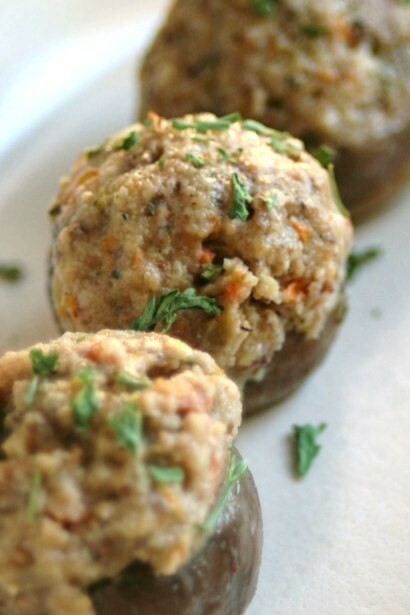 A fantastic combination of everything delicious all stuffed into a bite-sized mushroom! No meat or seafood in these. They are perfect just the way they are. Another holiday appetizer I serve every year. Preheat oven to 400 degrees F. Remove stems from mushrooms. Melt the butter in a medium saucepan over medium heat. Stir in the chopped stems, carrots, celery and onions and cook until soft, about 5 minutes. Stir in lemon juice, lemon zest and wine, continue cooking another 2 minutes. Remove from heat and add bread crumbs, and parmesan cheese. Thoroughly blend the mixture. Place mushroom caps cavity side up in a 13×9 inch pan. Stuff mushrooms with mixture and bake uncovered in the preheated oven 20 to 30 minutes, until lightly browned. Slice up 2 lemons. Serve warm with lemon wedges.